Wow. I can’t believe it’s almost the end of May and I’ve hardly done any sewing… or blogging for that matter. I just haven’t done much to share with you, dear reader! I did sew up a gown for a friend of mine who had a concert a couple of weeks ago, but I wasn’t able to get any decent photos, so I haven’t mentioned it. She’s coming over on Wednesday, and I hope to get photos and write the review later this week. We used Kay Unger’s design for Vogue 1206 and a french navy satin-backed crepe. It was very elegant, and I can’t wait to show you the pictures! Last week was spent shopping and opera-going with a good friend of mine visiting from Edmonton, so my sewing table was very sadly neglected. I did manage to finish up the smocking on a dress for DD3, though. It’s now blocked and ready for the embroidery, which I will take along with me this coming weekend on a training course. Hopefully I’ll get the embroidery finished so I can put the dress together when I get back next week…. when it’s JUNE! And speaking of June, I’d like to add my little commitment to Me-Made-June ’11. I, Tia Dia of MezzoCouture, sign up as a participant of Me-Made-June ’11. I endeavour to wear at least one Me-Made item each day for the duration of June 2011. Voilà! Now I’d better get sewing and pray for warm weather, since most of my MezzoCouture garments are for warmer-than-we’ve-been-having weather…. My sewing room has not seen much action this month. Maybe May is anti sewing month. I read a few other blogs and not much has been going on. I made one item this month. My daughter’s graduation dress. I hope June is more prodective. Your smocking is so beautiful. Wow! 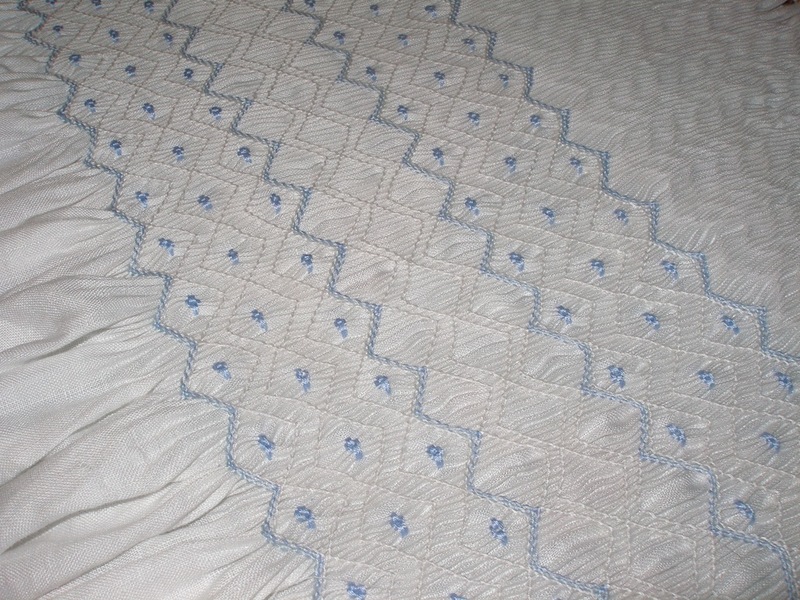 You smocked all that by hand! It’s beautiful. I’m not surprised it takes a long time to make a dress like that.